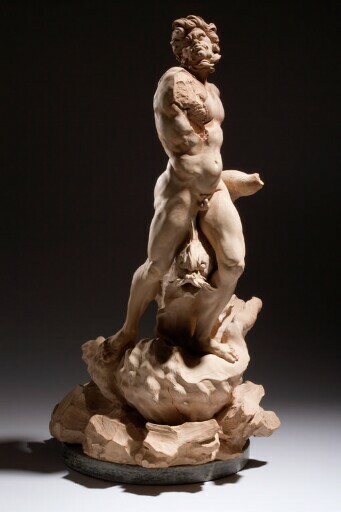 Bernini made this dramatic image of a triton (a minor sea-deity of Greek mythology) grappling with a fish atop a gigantic shell as a presentation model for Pope Innocent X Pamphili, who in 1651 commissioned the artist to design a new centerpiece for the fountain at the south end of the Piazza Navona in Rome. A few years earlier, Bernini had designed the spectacular Fountain of the Four Rivers as the focal point of the refurbished piazza. This second fountain, located opposite the Pamphili palace, would further beautify the site and glorify the Pamphili family. Modeled with the virtuosity and brio that characterize the work of the greatest sculptor of the Roman Baroque, the Kimbell modello surpasses all other Bernini terracottas in scale, degree of finish, and quality. The twisting stance of the figure was designed to engage the visitor from every vantage point. The primal-looking face and waving hair place the triton in the realm of the elemental forces of nature. Bernini’s fluid mastery of the human form is apparent in the well-muscled body, derived from life study and antique sculpture. Throughout the sculpture, the skillfully varied finishing of the clay—using a comb, stick, and brush to differentiate areas of flesh, hair, shell, and rock—animates the surface. The carving of the full-scale marble Fountain of the Moor was assigned to Gian Antonio Mari, working in Bernini’s studio under the master’s supervision. purchased by Kimbell Art Foundation, Fort Worth, 2003.